Unusual broadside view of the Statue of Liberty predating the construction. Probably meant as wrapping paper! 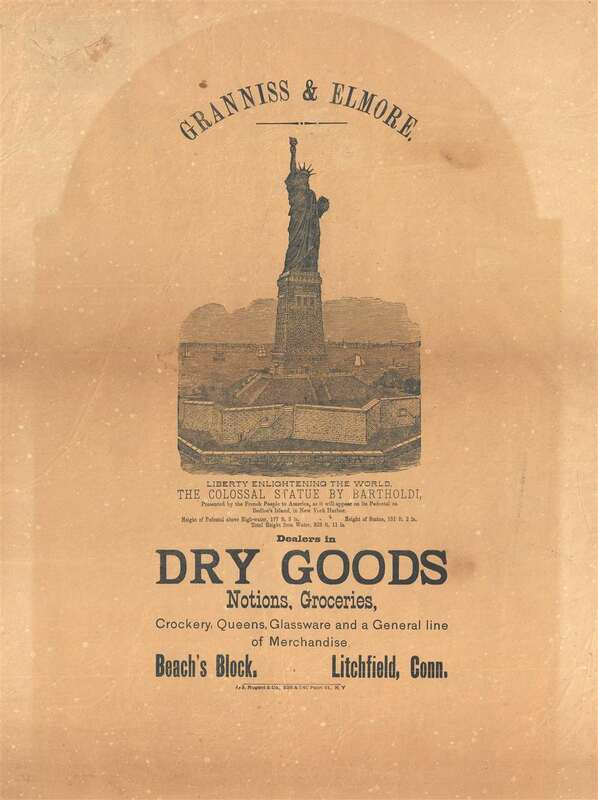 This is a rare c. 1885 broadside pre-construction view of the Statue of Liberty published to promote the Litchfield, Connecticut dry goods firm of Granniss and Elmore. The view illustrates the Statue of Liberty from the south, looking north towards southern Manhattan and the Brooklyn Bridge. The image of the iconic statue here pre-dates the construction of the monument on Bedloe Island and there are inconsistences between the view and the actual statue. Among these are a taller base and variant platform structure. This image was derived from the stunning officially sanctioned lithograph illustration of the statue issued by Root and Tinker in 1884. The Statue of Liberty was designed by Frédéric Auguste Bartholdi and constructed by Gustave Eiffel. The gigantic statue was a gift of the people of France to the United States to commemorate the triumph of 'Liberty.' The statue's great copper arm was displayed at the Centennial Exposition in Philadelphia in 1876, and in Madison Square Park in Manhattan from 1876 to 1882. Nonetheless, funding the project proved difficult, especially in the United States. As late as 1885, construction of the pedestal was stalled for lack of funds until publisher Joseph Pulitzer backed a fund-raising initiative to complete the base. The present view may have been influenced by the general enthusiasm for the Statue of LIberty that the drive engendered. This broadsheet was issued by J. S. Nugent and Company. As the paper is extremely thin and very fragile, and Nugent was a packing supplier, we can assume it was made as wrapping paper. That this fragile piece has survived to this day is nothing short of a wonder. John Strachan Nugent (August 11, 1850 – April 10, 1920) was an American businessman, stationer, box maker, and printer active in New York during the latter part of the 19th century. Nugent was born in London, Ontario, Canada where he lived on the family farm until sixteen. At sixteen, he was sent to Victoria College where he studied for two terms before relocating to New York City where he took work at Lord and Taylor, a general merchandise store on Grand Street. In 1867, he took a new job as book-keeper for a stationer. On March 1, 1876, Nugent partnered with Elbert O. Steves, founding the printing and box firm of Nugent and Steves. Nugent bought out Steves shares in January of 1883, taking on a new junior partner, john F. Romig, and renaming the firm, J. S. Nugent and Company. By 1885, he was one of the largest paper box manufacturers in the United States. He was also a member of the Brooklyn Union League, a Republican social club with significant political influence. In August of 1891, J. S. Nugent and company partnered with five other large box companies to form the New Jersey based National Folding Box and Paper Company. Before the merger, Nugent maintained offices at 538-540 Pearl Street, New York until 1890, when they relocated to 16 Reade Street. He lived at 97 Hancock Street in Brooklyn, NY. Good. Even overall toning. Backed on archival tissue for stability.